The flowers are in a great many closely-tiered whorls which are contiguous (when the flowers are open). The stems are branched creating a proliferation of tiered whorls. The sepal-tubes have an unusual pinkish-purple hue. The lower leaves of Balkan Clary are fairly distictive mainly lanceolate but with a ±parallel-sided centre section and mostly crenate (rounded) teeth. The stems are squareish in places. Hybridizes with : Meadow Clary (Salvia pratensis) to produce Salvia × sylvestris. However, your Author cannot decipher the blurb in a major botanical book about hybrids of this and that which produce those and them aka us and these with that and this. Maybe some Claries are having orgies with their cousins. But your Author was able to decipher that both Balkan Clary and these other hybrids all have violet-coloured flowers (or purple, blue, pink or even white in the case of the hybrids). The ease with which Balkan Clary can hybridize has resulted in many cultivars which are difficult to identify with any certainty. And so it is likely to be with the specimen shown above. The specific epithet nemorosa means 'of the woods' and this is its preferred habitat, but there and in the north of England it is in danger of extinction from slugs which do not seem deterred by the many secondary metabolites to be found within Balkan Clary. 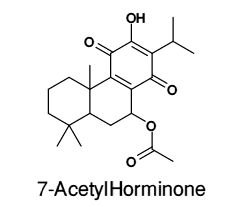 Diterpenoids: Nemorone , Nemorosin (which are both named after the spethific epithet of Balkan Clary), Salvipisone , Pachystavone , Horminone and 7-AcetylHorminone . All those diterpenoids on the right-hand side possess a quinone moiety which will likely bestow those compounds with colour, whereas those on the left lack this moiety. 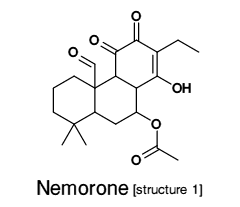 There are two different structures on the web claiming to be Nemorone. The one on the left has a quinone arrangement with two diametrically opposite ketone (=O) moieties on the 6-membered carbon ring, whereas the one on the right has two adjacent =O moieties. 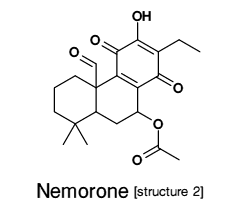 Your Author thinks the more plausible structure for Nemorone is the 'structure 2' compound on the right, particularly since no other compound found within Balkan Clary possesses these two adjacent ketone (=O) moieties, but many possess the quinone arrangement of diametrically opposite ketone moieties. 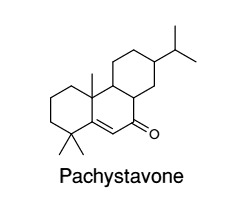 Pachystavone was discovered first in Salvia pachystachys, a Clary not found in the UK, but subsequently also discovered in Balkan Clary. Except for the one moiety on it (a ketone moiety) it would an un-adorned diterpene, perhaps a precursor to most of the other secondary metabolites shown here. It is an Abietane diterpenoid quinone compound likely to be coloured. It has bacteriocidal properties, inhibiting protein synthesis in several types of bacteria. 7-Acetyl Hominone just has an acetyl-group substitution on one of the -OH groups, the same position it is in Nemerone (structure 2). 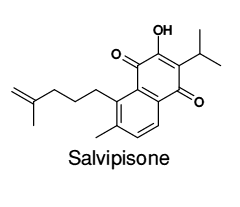 Another abietane diterpenoid quinone compound, Salvipisone is also a potential anti-biofilm agent active against antibiotic resistant Staphylococci bacteria (and other gram-positive bacteria such as Enterococcus faecalis) better than most other known antibiotics. But it is in-effective against gram-negative bacteria (such as Escherichia coli or Pseudomonas aeruginosa). 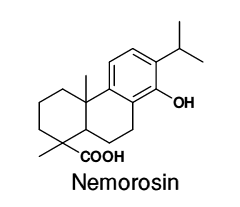 Nemorosin seems to be the only other one which lacks the quinone moiety, whereas the rest (on the right) do. And neither does it possess the adjacent ketone (=O) moieties which the highly-suspect Nemorone (structure 1) is said to possess. 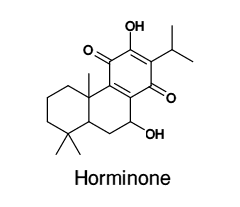 Flavonoids are almost invariably yellow compounds and these two probably do not break the mould. Many are also poisonous. 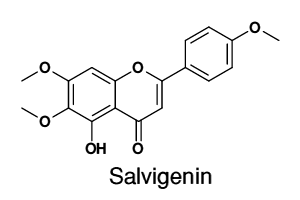 Salvigenin is obviously named after the Salvia genus of plants it is found in, whereas Eupatilin is also found in the Artemesia species of plants. 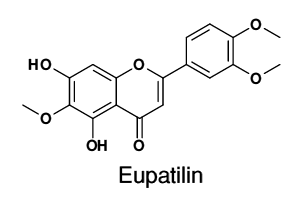 Eupatilin possesses anti-peptic, anti-inflammatory, anti-oxidant, anti-cancer and anti-allergenic and has long been used in chinese medicine. Its synthetic derivative called DA-6034 has medicinal uses. 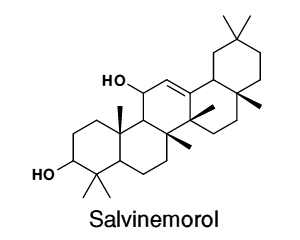 Salvinemorol a steroidal compound plus the Megastigmane Glycosides: Salvionoside A, B and C (all of which are named after the Salvia (Clary) genus in which many are to be found). More Steroidal Glycosides are also to be found in Balkan Clary: α-Amyrin, Ursolic Acid, Oleanolic Acid, β-Sitosterol, Stigmast-7-en-3-one , Stigmast-4-en-3-one , Stigmast-7-enol and 24-MethyleneCycloArtenol .